This range of DMX to network converters and controls operates over Artnet, sACN and Shownet as standard protocols. They offer remote programming and monitoring, using the ELC dmXLAN software which may be downloaded at no charge. Nodes range from the 'Buddy', offering two DMX ports and a single Ethernet connection, to eight-port devices which may be combined to produce a system with 120 fully-programmable DMX/RDM ports. 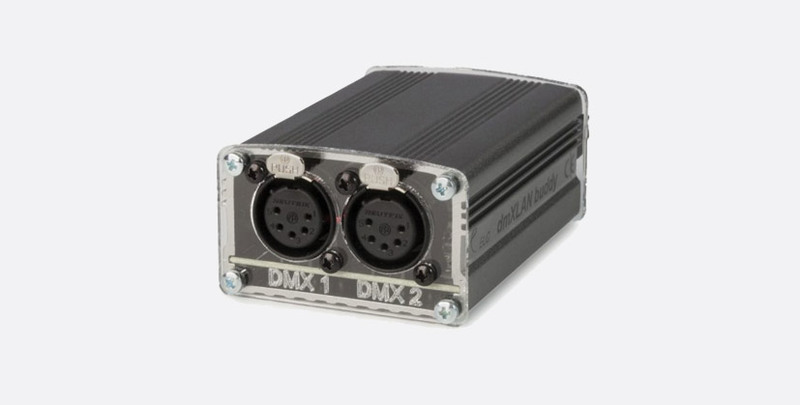 DMX output options available are normal, merging in HTP, channel custom, priority merging, full softpatch (channel by channel), programmable merging with DMX channel control, with support for WYSIWYG, ESP, Capture. This is a 2-port DMX to Ethernet node, allowing dynamic merging, fixture control and RDM (Remote Device Management) support. Utilising 2x 5-pin XLR connectors to provide 2x DMX-512 ports that can be programmed as input or output, it offers 1024 DMX channels. An RJ45 socket provides the 10/100Mbit Ethernet connection; a USB connection is used for the power supply and setup software. Dimensions: 40mm x 64mm x 84mm. USB-B cable required. Ethernet to DMX adapter nodes, these are used for converting data between one DMX universe and an Ethernet network, for remote programming and monitoring.They support Art-Net / sACN / Strand shownet and are fully supported by the dmXLAN software. 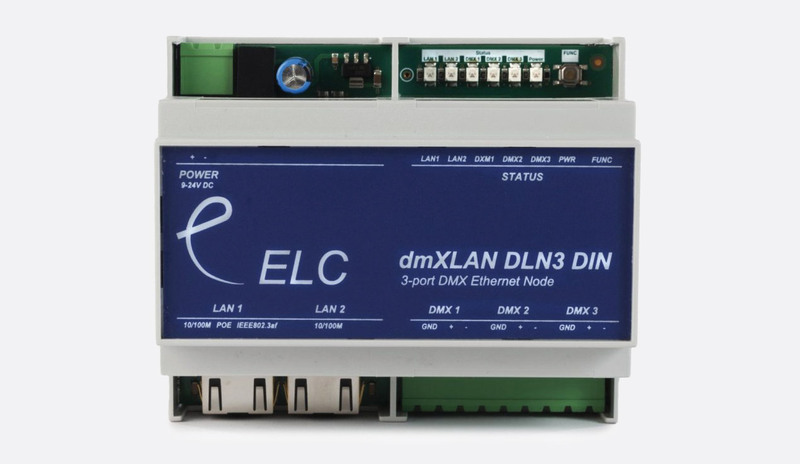 The DLN1SM and DLN1SF are POE powered, desk or surface-mounted Ethernet to DMX adapter nodes with a male or female 5-pin XLR for the DMX port and 1x Ethercon connector for the network connection. Power source: POE (IEEE 802.3af). Dimensions: 43 x 71.12 x 83mm. Weight: 0.5kg. The DLN1DIN mounts on a DIN rail, and may be powered using POE (IEEE 802.3af) or by a source of 12V 200mA DC power. Power and DMX connections are via screw terminals, an RJ45 connector provides the network connection. This range connects 3x bi-directional, RDM compatible, DMX ports to 2x Ethernet 10/100MBit Ethernet network ports, with an internal switch providing the second Ethernet port for either a local lighting desk, a PC running ELC dmXLAN control/management freeware or additional Ethernet switches or nodes. The DLN3DIN and DLN3DINFI mount on a DIN rail. 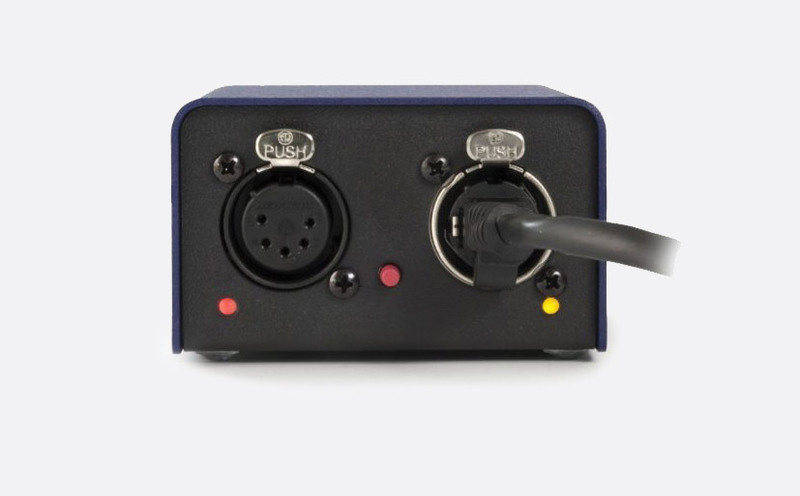 They have 3x 3-pin DMX ports (fully isolated in the case of the FI) connected via screw terminals and 2x RJ45 connectors. Power source: 9-24V DC, 200mA external power supply required. Weight: 0.5kg. The DLN3TM and DLN3TM FI are AC mains powered and desktop or 'truss' mounting; there is an M10 mounting thread on the underneath.The front panel has a display and rotary encoder control for local configuration of DMX and network parameters. Connectors are on the rear of the unit; 3x female 5-pin XLR DMX ports (fully isolated in the case of the FI) and 2x Ethercon for network. Power source: 100-240V AC 50/60Hz, captive power lead. Dimensions:150 x 200 x 50mm, 1.4kg. The DLN3TMPoE and TMPoEFI are POE powered and desktop or 'truss' mounting; there is an M10 mounting thread on the underneath.The front panel has a display and rotary encoder control for local configuration of DMX and network parameters. Connectors are on the rear of the unit; 3x female 5-pin XLR DMX ports (fully isolated in the case of the FI) and 2x Ethercon for network. Power source: POE (IEEE 802.3af). Dimensions:150 x 200 x 50mm, 1.4kg. Optional accessories: RMDT 19 inch rack mounting kit for DLN3TM variants. The dmXLAN Node 6X combines 6-ports for DMX via 5-pin female XLRs (fully isolated in the case of the FI) to Ethernet nodes with a 3x front facing Neutrik Ethercon and 2x rear facing RJ45 connectors in a single 1U high rack-mounting unit. This fully programmable node can be controlled via the LCD menu display and encoder switch on the front panel, or through the ELC downloadable dmXLAN freeware. Power source: Either 100-240V AC 50/60Hz with captive power lead or POE (IEEE 802.3af), dependant on variant, see below. Dimensions: 80 x 280 x 160 mm. Weight: 2.5kg. Offering 8 fully-isolated, fully programmable DMX ports and a dual port Gigabit switch with user interface and RGB LED indication for data splitting, merging, softpatching and backup when programmed using ELC dmXLAN software. The output of the DMX ports is measured continuously and detected changes and errors are appearing on the display and in dmXLAN. Dimensions: 80 x 165 x 45 mm. 1x NAC3FX-W power connector included. The DLN8GBXSL has 8 fully programmable DMX ports and a dual Gigabit port switch but can only be used as a slave to the dmXLAN switch GBx 10 or dmXLAN switch GBx 18. The DMX ports can be configured via the user interface of the switch or with the dmXLAN software. Up to 15 of these slave units can be connected to the switch, giving a system rack with 120 fully programmable DMX/RDM ports. Dimensions: 480 x 165 x 45 mm, 1x NAC3FX-W power connector included. Note (1): 35mm DIN EN 60715 rail mount, DIN 43880 form factor, occupies 6 DIN module spaces (108mm). Note (2): Neutrik 16A Powercon true1 power inlet and loop output connectors.